I basically survived on granola bars in high school. Pre-packaged, too sweet, milk chocolate granola bars at lunch and before volleyball practice. Every day. Naturally, I’ve been pretty burnt out on granola bars for the past ten years. Then my friend Sara (whom I met through the blog) texted me the ingredients list for a granola bar and requested that I recreate them. I trust Sara’s taste in granola bars and thought I’d better give these a shot, so I stopped at the nearest Kaldi’s Coffee shop to pick one up. I made it out to my car before peeling off the packaging. One bite and I was hooked. This granola bar was unlike any other granola bar I’d ever encountered. I tasted honey, sea salt, dark chocolate, oats and cinnamon all at once—each flavor teetered on the edge of overwhelming the others yet somehow the sum was perfectly balanced. Plus, unlike those packaged, processed granola bars I’d grown up eating, these were legitimately healthy granola bars. I immediately added the ingredients listed on the back of the package to my grocery list and headed to the store. 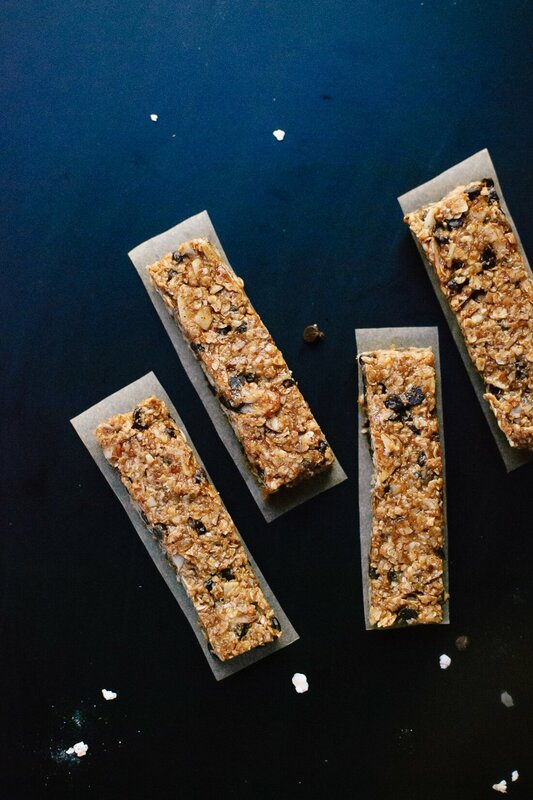 It took me five tries to get these granola bars just right. I thought Kaldi’s granola bars were baked because the oats weren’t entirely intact, but my baked bars were all wrong. 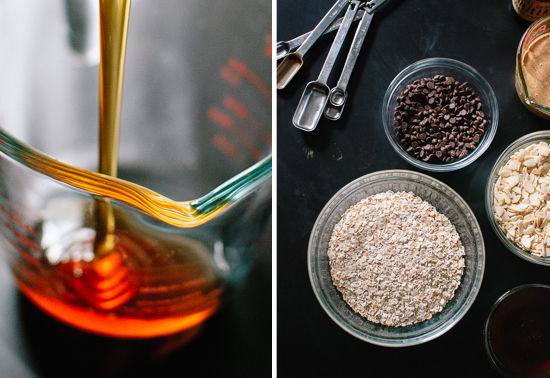 Then I tried no-bake bars with old-fashioned oats. While the flavor was pretty spot on, the texture of the oats was too distracting. Finally, it occurred to me to use quick-cooking oats—oats that have been rolled out thinner and cook in about 60 seconds—to get the right texture. Quick-cooking oats did just the trick and I delivered a bag of pre-packaged bars to Sara as a belated birthday gift. I think you guys will appreciate these, too. The bars hold together well, although each batch I’ve made has turned out slightly different. I suspect the differences boil down to slight measuring discrepancies between the batches. 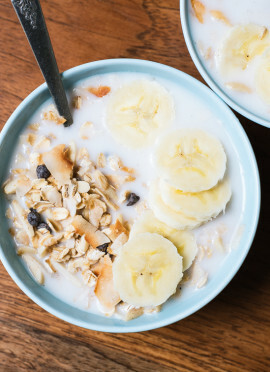 For the most firm bars, you might need to sprinkle a few more oats into the bowl—enough that you think it’ll be almost impossible to mix them all in. Once you put some arm muscle into it and get those oats mixed in, you’re in business. You might also want to tinker with the amount of salt. I’ve been using unsalted Trader Joe’s almond butter, which is nice and spreadable, plus I can control the salt content. I like my bars a little salty (and therefore totally addictive), so I go with the full 3/4 teaspoon, but you might want to scale back to suit your preferences. Feel free to change up the mix-ins, too. Check the recipe notes for details! Chewy, no-bake, gluten-free granola bars made simply with oats, almonds, almond butter or peanut butter and chocolate chips. 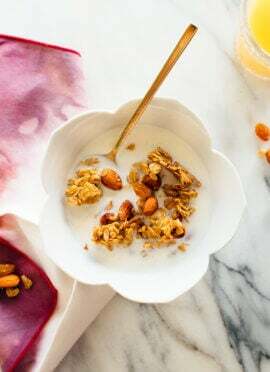 This healthy granola bar recipe is so delicious and easy to make. 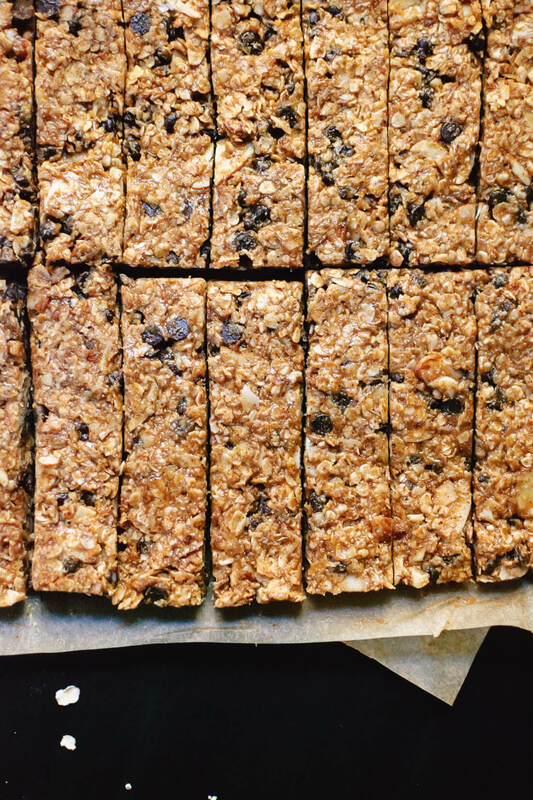 Homemade granola bars are great to keep on hand for traveling or whenever hunger strikes! Recipe yields 14 to 16 bars. Line an 8 to 9-inch square baker with two strips of criss-crossed parchment paper, cut to size. In a mixing bowl, combine the oats, almonds, chocolate chips, cinnamon and salt. Whisk to combine. In a 2-cup liquid measuring cup, measure out the nut butter. Top with ½ cup honey and the vanilla extract. Whisk until well blended. If you must, you can gently warm the liquid mixture on the stovetop or in the microwave, but make sure it’s cool before you pour it into the dry mixture (the chocolate chips will melt). Transfer the mixture to the prepared square baker. Use your spoon to arrange the mixture fairly evenly in the baker, then use the bottom of a flat, round surface (like a short, sturdy drinking glass), covered in a small piece of parchment paper (see photo), to pack the mixture down as firmly and evenly as possible. Cover the baker and refrigerate for at least one hour, or overnight. Use a sharp knife to slice the bars. For portability, you can wrap individual bars in plastic wrap or parchment paper. Bars keep well for a couple of days at room temperature, but I recommend storing individually wrapped bars in a freezer-safe bag in the freezer for best flavor. Recipe adapted from Sally’s Baking Addiction and Smitten Kitchen. Make it gluten free: Be sure to buy certified gluten-free oats. Make it vegan: Substitute maple syrup for the honey and use dairy-free chocolate chips. Make it dairy free: Use dairy-free chocolate chips. Change it up: Feel free to substitute chopped, toasted nuts for the sliced almonds, and chopped, dried fruit for the chocolate. If you love this recipe: You’ll also love my honey almond granola, maple peanut butter chocolate chip oatmeal cookies and gluten-free chocolate chip cookies. Healthy and super super SUPER good! I dont even like almond butter and nuts. Any idea on the calories etc. in these? Hi, Carol! Unfortunately, I don’t have nutritional info available for my recipes just yet. I’m looking for a solution, and will update about it once I find one. Thanks! I am addicted to the Kaldi’s G bars-so I tried this, and they taste the same, but the texture is softer and chewier, not as crunchy as the Kaldi’s. Are you positive Kaldi’s doesn’t bake theirs, even for a short 1-=15 mins? I thought I would try another batch and bake them at 350 for 10-12 mins. Any thoughts here? Hi again, I tried another bar recently that was a corner piece and I think they are baked a bit. Please do let me know if you try. Fabulous. I used Canadian maple syrup instead of honey. Got lazy on my third batch and warmed the liquid ingredients for mixing and did not let them cool COMPLETELY. The chocolate chips softened and merged with the oats somewhat. Still fabulous, but I prefer the chips intact and crisp. Your book Love Real Food gets released on May 16th at Amazon.ca. If you are ever scheduled for signings in British Columbia or Washington State please post the details. My dog would probably get along well with Cookie if she comes! This is a wonderful receipe and I tried the same substituting chocolates with some dried fruits. The taste came out perfectly but the bar is not hard enough and breaks to pieces. I left it overnight in freezer and I still face the same after taking out of the freezer. Is there anything I can do to avoid this? Hi Annu, I’m sorry to hear that. These bars are never super firm. It sounds like maybe you needed a bit more nut butter to bring it together? So yeah, these sound amazing! I’ve always loved granola bars, but now that I’m a mom of 3 little boys, I pretty much thing of them as go-to diaper bag snack. They’re easy to pack, healthy, and the boys will actually eat them! I’m always looking for new recipes to try out on them and I think they’re going to love these! Anyways, I run a site of my own and just wrote an article about healthy Easter basket ideas, instead of filling the kids up with candy. I included this recipe in the list! Here’s the link if you want to check it out! Thanks for the delicious looking recipe! I’ll let you know what the boys think! Thank you so much for the shout-out, Laura! What a great blog, too. I hope you have a fun, family-filled weekend! I feel these bars are baked, so I just baked a batch at 350 for 30 mins. It wasn’t too much! I tried 15 mins at first, wasn’t even close. 30 did it-on Convection. They are still a little too crumbly for me, so the next batch I am going to reduce the amount of almond butter to 2/3 cup and increase the honey to ¾ cup. Also, I picked up some Hershey’s mini dark chocolate chips, but I find that a thin dark chocolate bar, chopped is better-the chips are too sweet, especially since I will try increasing the honey. OK-I will keep you posted. Thanks for commenting, Allison! All good to know. I made these last night, just as instructed. I used peanut butter that I bought from the bulk foods section of Sprouts. They are very tasty but mine turned out extremely dense and rich. Are they supposed to be like that? I copied the recipe exactly to the T except for the peanut butter being a more natural kind and I left out salt because the peanut butter was salted. I can’t eat more than a couple of bites at a time because they are SO rich! I wanted these as a breakfast substitute because they look so tasty and seem really portable (grab & go). I love this recipe! I add flax meal and change up the nuts sometimes too. Last time I added some Rice Krispies and that was a great texture change. I love these for breakfast on the go that actually fills me up. Thanks! You’re welcome, Emily! Your take sounds creative and delicious. Recipe as a good alternative on the go for my husband, four kids and myself. But we found them far too sweet. I’m afraid if I reduce the honey they won’t stick together as well. I used sugar and salt free peanut butter. I’m sorry this was disappointing, Ann. My daughter (also a Kate, age 12 1/2) was looking for the perfect granola bar recipe, because she was sick of the store bought bars. After trying several different recipes, she found yours and she LOVES it! It’s become almost a weekly thing for her to mix up a batch. We look forward to trying more recipes, soon. Thanks for helping us eat healthier! Oh, I’m so glad these were what Kate was looking for! You’ve got a resourceful 12-year-old, Ayme! Thanks so much for commenting. After making these for the umpteenth time, I thought I should say that these granola bars are the *best*. 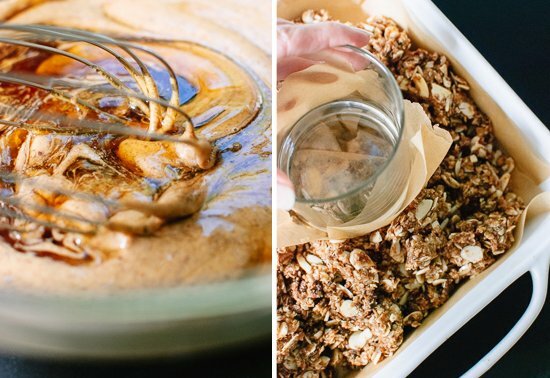 Thanks to you, I never buy granola bars anymore because I know I can make homemade ones that taste so much better and take less time to make than a trip to the grocery store. I’ve taken them on trips and scarfed them down post-runs. Sometimes they start to fall apart if they’re at room temperature for a while (for example, when I travel) and I was wondering if that’s normal or if perhaps I need to press them down better. Anyhow, thanks a million for another killer recipe! You’re welcome, Rana! My most recent post is a pecan granola bar recipe–I think you’d like it! Hi there! Thank you for posting this recipe. I can’t wait to try it. Kaldi’s granola bars have butter in them too and like you I always thought they were baked. So did you omit the butter intentionally or just not need it since they are no-bake? I really want one!!! This recipe is delicious! Want to try it again with raisins. Thanks! 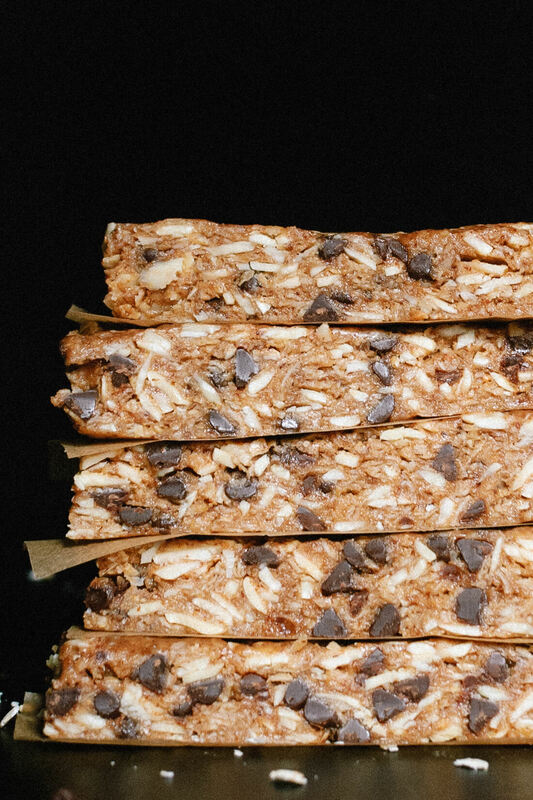 This is such a delicious granola bar recipe, thank you! I am thinking about baking them to see if that might help mine stick together better. Do you have any suggestions for time and temperature? I make these with my grandson often and they are Delicious! Thank you! Welcome! Thanks so much for the review, Nancy. This recipe sounds amazing! A quick question about whether we can substitute the nut butter with coconut oil? Also planning to replace honey with date syrup.Can I follow the same proportions for the all with the substitutes? Hi Ruchi, Great questions! The nut butter is needed for binding, flavor and protein purposes. Unfortunately, coconut oil will not provide the same result As for The date syrup, I haven’t tried it but it should work to provide the sweetness needed. I hope this helps! Thanks for the reply Kate. The family is not a fan of peanut butter & we don’t get any other nut butter easily where we live. Is there any other substitute, that you think will work well? 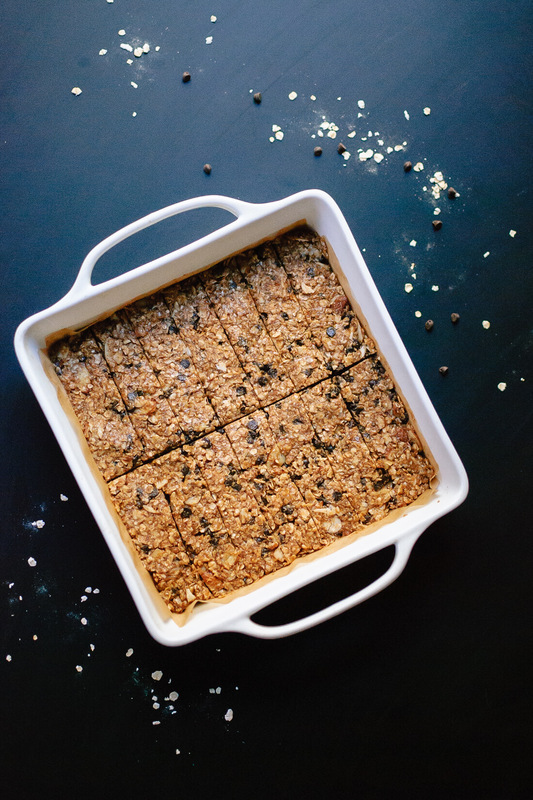 Will baking it help the bars bind, if I use coconut oil? I haven’t had a ton of luck getting the bars to stick together and not crumble apart, but I absolutely love the flavor and everything about these! Do you think it would work the same if I formed them into the balls like you did in the cook book instead of bars? Simple to make, delicious to eat! We keep them in the freezer and like them best when they’ve sat at room temperature for just a few minutes (but they’re great packed in lunches too). Very crumbly. What did I forget? I’m not sure Brenda. Did you use quick cooking oats and ensure you had the binders in there at the right quantity (nut butter and honey or syrup)? Hi! I have this in the fridge right now and excited to try it out :) I was just wondering whether you tried baking this in the oven? What would happen if we do? Thank you! Let me know what you think! Baking dries them out and they don’t hold together as well. AH.Mazing! Just made these. They are fantastically delicious. I will be taking these on OUR volleyball tournaments. Thank you!! They pack great taste with healthy calories to keep our player going! You are so talented Kate. Thank you so much for sharing. Yes, so very good! Thank you, Angela for your sweet words. I appreciate the review. Trader Joe’s. I recently went online and saw a number of recipes, however the reviews were fair to not so good. Then I came upon yours and felt good about the reviews. Tonight was the 5th batch that I made and they all came out very well. The last 2 batches I substituted 1 cup of Trader Joe’s gold raisins for the 3/4 cup of chocolate chips and am very happy with them. I buy double sealable snack portion packs from Walmart which is a very good fight for one bar. Then put the sixteen bars in a gallon freezer bag. Daily, I remove one bar for my mid morning snack at work. Delicious. Thank you for the very nice recipe. Thanks, Ed! I’m happy to hear you love them! These are delicious!! I made them last night and had to restrain myself to just 1 this morning! Your recipes are amazing Kate you have such a talent. That is so hard to do, I know! Thank you, Alisha for your review. Great recipe. Easy to make. Get alot requests for it. That’s great! Thanks for the review, Sandy. These look amazing! 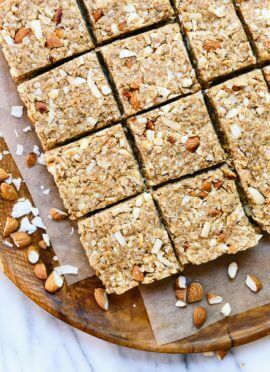 Looking for a homemade bar to replace a granola bar my husband always takes to work! Can you share the nutritional info again? When I click on it under the recipe, I don’t see it showing up. Thanks for commenting, Lisa! I would love to hear what you think. Try refreshing your browser. It should be there :) I have had issues with it in the past, but looks to be fixed now. Where do you get mini dark chocolate chips? I can only find mini semisweet. I just used regular dark chocolate chips in the recipe but I’d love to find minis to use! My family lives these granola bars, I make them all the time. They should be in the baking section along with the other chocolate chip options, at most grocery stores. I’m sorry you are having a hard time finding them! Batch #1: May 20, 2018. Thanks for the recipe. I made these today. Easy. But, of course, I forgot to add the vanilla. First taste: great! Batch #2 will be made next week where I’ll add the vanilla and maybe a little more oatmeal. Stay tuned. These look fantastic!! (As do ALL your recipes- IMO- it pays to be a perfectionist… :). I’m hiking the Italian Alps this summer and was told that being vegan would “be very difficult” and suggested I bring food with me. Do you think these granola bars would survive the flight, and several days prior to the hike? Assuming I don’t finish them on the plane….LOL….!!! I think is does too, most days that is. :) They should work if you keep them wrapped and stored cold prior too. But these are best stored in the freezer or refrigerator. You might have better luck with these: https://cookieandkate.com/2016/almond-coconut-granola-bars/. Good luck! I made these for the first time today with my 1 and 3 year old. They are delicious!! My kids loved them too. I didn’t have sliced almonds so I used chopped ones and added unsweetened coconut flakes but otherwise followed the recipe. I had salted peanut butter so only added an extra 1/2 tsp. of salt. Mine do seem to be a bit crumbly but for my first try they turned out pretty good. I will add more oats next time to see if I can get them to stick together better (as suggested above). Thanks for the great recipe. I will be making these again soon!! Thanks for sharing, Allison! I appreciate your star review. We found your recipe about a year ago and my 13 year old daughter has been making the regularly. Thanks so much for sharing your talents! I love that! Thank you, Ayme for your comment and review. I have been eating these delicious, yet overpriced granola bars from my local Kayak Coffee (which is a Kaldi shop) and googled ways to recreate them. I have no idea If they are the exact same ones 4 years later but I think they are darn close. I’m so excited to try them!! Thanks for posting! Lovely to hear, Ann! Let me know what you think. These are so so good! I did the full 3/4t of salt and I love the salty sweet goodness. I couldn’t quite get all of the last bits of the ingredients incorporated and i had a few of the bars break apart when I was cutting them but that just gave me an excuse to taste test. Yum!!! These granola bars are just delicious! Your recipes never disappoint. I have to tell you, you have changed my life with your simple and delicious recipes! My goal has been to stop buying packaged snacks and breakfast foods and I’ve succeeded thanks to you! For the last 4 weeks, I’ve tried different recipes from your website and have enjoyed cooking. You’re so sweet! Thanks so much for your sweet comment and review. I’m really happy they have been so helpful! Have you tried agave in lieu of honey? It might not stick together as well but I’m thinking of trying half agave half honey. What do you think? I don’t use agave as it doesn’t seem to work as well for my recipes. I typically stick with honey or maple syrup. You could see what others have tried by searching the comments! Great, Katie! Thank you for your review. This recipe is very high in calories from fat and sugar. How is this really healthy? Hi Susan, everyone’s definition of healthy is different, but I call these healthy because they are quite hearty and filling, are made with wholesome ingredients and no preservatives, and are high in fiber and protein. Regarding fat content, most of that fat is unsaturated (e.g. heart healthy). If you are concerned about calories, you could simply cut the bars into smaller portions. Best regards. I’m excited you think so, Julie! I appreciate the review. Would it still work if I used almond milk instead of almond butter? If not do you have any suggestions on how to use almond milk in a sweet treat like these? I bought almond milk yesterday for the first time and the family all hates it, not sure how we can put it to good use. Hi Ella! You could use almond milk in my favorite chia seed pudding! Almond butter and almond milk aren’t substitutes for each other and wouldn’t work. Sorry! Yum! Love these, but haven’t found dark chocolate mini chips. So I use semi sweet and then reduce the honey to avoid being too sweet. Thank you for sharing, Aline!